Smooth, Orange Foaming Soap With Germ-Killing Power Is Designed For Use In Gojo Fmx-12 Foam Soap Dispensers. Antibacterial Soap Has An Orange Blossom Fragrance. The 1250 Ml. Refill Delivers More Than 1,700 Handwashes And Comes With A Fresh Dispensing Valve. 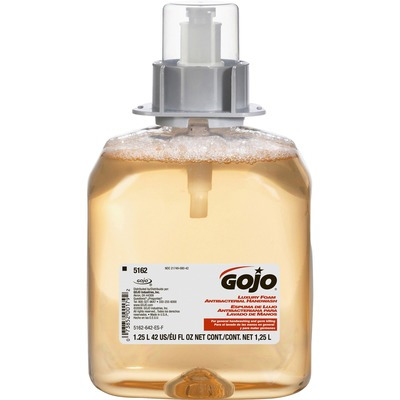 Gojo Sanitary Sealed Design Helps Lock Out Germs.. Smooth, Orange Foaming Soap With Germ-Killing Power Is Designed For Use In Gojo Fmx-12 Foam Soap Dispensers. Antibacterial Soap Has An Orange Blossom Fragrance. The 1250 Ml. Refill Delivers More Than 1,700 Handwashes And Comes With A Fresh Dispensing Valve. Gojo Sanitary Sealed Design Helps Lock Out Germs.